Popsicles are a summer staple. 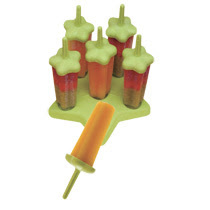 Now stores like Sur La Table and Target are making it easier for people to create their own popsicles. This past weekend, I took popsicles to a new level with my own at home “spirited” concoction. I used the recipe below found on drinkmixer.com and star molds from Sur La Table to create a little treat for Friday’s fireworks on the beach night. While they were a total hit, I believe I put a little too much fun into the pops and they melted very quickly. However, eating them outside was a great idea so the pops didn’t drip on the carpet. If you come to my apartment in the next week of so, you just might be able to taste one of the remaining pops!